If you ever hoped to pretend your phone were a fish or an aquatic plant, Sony would like to present its Xperia Z1S. The brand, along with Wieden + Kennedy and development partners Motim and SoftFacade, is demonstrating the phone's waterproof technology by developing apps designed to be used in and under the water. 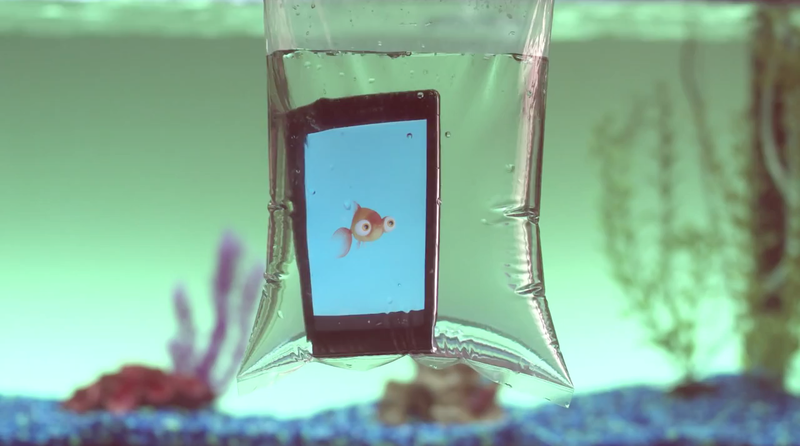 A new feature on the phone uses ultrasound to sense when the phone is submerged. A handful of 30-second videos (directed by Sean Pecknold of Society) demonstrate the apps, which capitalize on that detection technology in ways unusual, somewhat amusing and mostly frivolous. One of the apps is "Goldie," an on-screen fish that flops around like it's dying when you take the phone out of the water. Another is "Plantimal," a modern cross between a Tomagotchi and a Grow Monster. There's also "Rainy-oke" for, quite literally, singing in the rain, as proven by a drag queen performing Cyndi Lauper. "Photo Lab" mimics the process of developing photos by hand, in an extra cutesy twist of the knife to a practice all but eradicated by the digital age. "Sink Sunk" offers perhaps the funniest and most practical application of the water detection technology: It's a simple game for when you're bored and cranky, hanging out in your kiddie pool. That's it, at least so far. The brand is making the source code for the feature available via Github, so other developers can play with different uses, too. In the meantime, it's a reasonably fun way for Sony to promote waterproofing, even though that feature is not unique to the smartphone manufacturer or model. And it fits well enough into the art-meets-engineering motif of the brand's "Be Moved" platform, launched with W+K early this year—even if it does feel a little heavier on the engineering part. The brand recommends you avoid submerging your phone for more than 30 minutes at a time, though. Just in case you were planning to take it on a nice long scuba dive.